Tuesday morning Danny asked to be let out, so I let him out and then went to get my shoes on. I don’t like to just leave him out by himself too long because I don’t want him wandering off and getting lost in the woods or chasing wild animals or anything. When I saw that Danny had settled right down on the deck, I stayed inside and checked on him now and then. After a bit I glanced up and saw deer running down the driveway with Danny in hot pursuit. Panicked, I raced outside yelling for Danny. I was relieved when he stopped and headed back up the driveway. Although Danny has never been trained, he has become obedient in his older years–although he is sweetly passive-agressive if he really doesn’t want to do something that I ask him to do. EJ said that he thinks Danny was just trying to make friends with the deer. However, he also said that it is a Hunter’s Code that if a dog chases a deer, they shoot the dog. I would be devastated if my Danny got shot so he will have to learn to not chase them. Yesterday morning I woke up and made coffee as I do every morning. I use a small pitcher to fill the coffee machine with water and then I pour any remaining water in the pitcher into the pets’ water bowl. This morning when I went to pour the water into the pets’ bowl, I discovered a dead mouse floating in it. Eew. I carefully carried and the bowl outside and threw the water and mouse into the grass. When I opened the door to come back in, Little Bear ran outside. I ran after him, and was scared when he neared the forest because it was still dark enough that I didn’t think I’d be able to find him if he ran into the trees. But he hunkered down a bit and I caught him and brought him back into the house. Then I found another dead mouse under the kitchen table. JJ said he had found a dead mouse last night. It’s not surprising we have mice when we live in a house in a forest that has been empty for two years. But….I am glad we have cats who kill the mice. EJ had an appointment with our doctor this morning. It was technically his “New Patient” appointment, but since he had already been to see the doctor when he had numbness and fainting spells, this was actually a follow-up appointment. Basically the doctor is determining that we all have symptoms of PTSD. 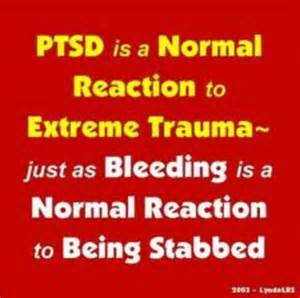 PTSD is not just something that soldiers in war zones get. People with serious illness and their caregivers, as well as victims of abuse also get PTSD. We have experienced these situations–and more. We were very thankful that our new doctor grasped our situation and was very understanding. When we have tried to describe to people how we are feeling, most of the time we feel like they think we are just complaining, or being negative, or not having enough faith. However, PTSD is not about any of these things. As EJ’s nephew has said, “PTSD is a normal response to an abnormal situation.” Our doctor said that she’d help us get through this. As we rose to leave, she gave me a hug, announcing, “I’m a hugger.” Then she gave EJ a hug. After we left the doctor’s office, we stopped at a seed store that I had found on the Internet. We fell in love with the store: It has so many interesting seeds, as well as pet supplies. One of the clerks helped us choose a mixture of seed that we can plant this autumn that will help stop erosion and also provide tasty meals for the deer. JJ needed new shoes, so after EJ left for work yesterday, I went to Eureka with him to buy shoes. It was a busy day for me. EJ’s sister and Mom is coming to visit tomorrow so I cleaned the house really well today. I ended up moving furniture around after EJ went to work. I like the new configuration much better. Meanwhile, EJ called our friendly Gravel Man to ask him deliver more topsoil tomorrow afternoon after our guests leave so that we can spend Labor Day weekend working on the driveway. After JJ got home, he discovered that he had a missed call from his oncologist’s office. The receptionist had left a voicemail message telling him to call “at his earliest convenience.” He tried to call, but it was after office hours. Of course, we both thought that maybe his CT scan had revealed that his cancer was back. We both felt complete panic. We didn’t know how we would make it through the night wondering if he had cancer, so JJ called the oncologist on call to demand to know what the call was about. He learned that apparently he had missed an appointment with the oncologist today. During our first visit to the oncologist in June, we were given a “Patient Itinerary” that listed all his scheduled medical appointments and instructions, including his port removal in late June and his recent CT Scan. Apparently that’s how they do things in the Emerald City. I double-checked: No doctor appointment was listed on the Patient Itinerary and we hadn’t received any reminder calls. The on-call Oncologist told JJ that the receptionist should never have left such a message and “It’s in my hands now and I will deal with it,” he declared. Good. We are practically shaking with the release of the panic and fear we felt at that message. Wow, after all that I see the mice are the least of the issues. I am happy that you have such a nice doctor, and hope you have a great weekend with the company.